We knew T-Mobile’s Phase 3 UnCarrier announcement was coming up soon and the carrier just let loose the date…October 9th. Let this date in October be marked onto your your Magenta calendars as the time we’ll find out exactly what T-Mobile has in store for the third and purportedly last phase of their UnCarrier plan to recapture both market and mindshare in the US wireless market. I know we are all eager to see what October 9th will bring and what kind of crazy on-stage idea T-Mobile CEO John Legere has in store. UnCarrier Phase 2 had puppets and a parody of AT&T’s “It’s not complicated” children’s commercial…so, what will Phase 3 bring? Is it weird how EXCITED I am for a press conference?? Secret meeting for some employees this Sunday. “Don’t miss it for the world.” International calling plan/discount? good joke too bad ive never had a dropped call from Tmobile in the past 5 years. I drop them a few times a week but I’m in a very mountainous area, so it’s more the terrain than anything. When I lived in Kansas I didn’t have those problems. What?? You’ll pass on the Shakira concert? You know her hips don’t lie. and her breasts are humble. did you get the invite this time? if not John Legere is doing it all wrong. FINALLY! haha :) it’s in NYC right? Maybe while on stage he will twitter. unlimited international roaming at no extra charge. a true world phone and carrier. thats my guess. Yeah, that’ll never happen. The overseas carriers charge an arm and a leg to the US carriers and then they stack on some extra to sweeten the deal for themselves. Tmobile USA could do this with their parent tmobile in Europe. That’s what I was thinking also. Free roaming with all the different T-Mobiles wherever they may be. That would so come in handy right now since I’ve moved to england! because I’m roaming on T-mobile UK – EE! Please tell me you’ve bought some plan in the UK, other than using the WiFi calling and roaming? Haha, yes I bought a phone plan with a company called 3. I only pop in my T-mobile sim to call home and keep in touch with the family when I’m on WiFi which is like 99% of the time. I was lost one day without wifi, made a call while roaming on T-mobile UK.. The call was 2 mins and I got charged $6.98! F*ck roaming charges lol.. No to mention $15/mb for data! I’ll say when I’m wrong. I never thought they’d do that. So now you get unlimited roaming in 100 countries for data but only 50MB of roaming in the USA. That’s just confusing. BOOM, billions of dollars in profits and AT&T and Verizon filing for bankruptcy. Woohoo can’t wait for that..~! You say that as if T-mobile has the same native coverage as Verizon. Verizon has probably 20x the area of coverage in the US. Their native towers have a larger coverage area than even T-mobile’s with the roaming partners. Most of T-mobile’s coverage map is roaming partners. T-Mobile covers 96% of all Americans with their native towers, while Verizon covers 99%. 99-96=3% more native coverage that Verizon has for the double the cost and half the data. You do realize that 96% claim is based on expanded coverage using roaming partners. The website even use to site that. The fcc’s information can’t be accessed right now due to the Gov. shutdown otherwise I can prove that. Look at go smart mobiles coverage map (that’s native t-mobile coverage) and tell me that that Verizon only covers 3% more than t-mobile. If you drive from Kansas to Bismark, ND then to Montana you wouldn’t be connected to t-mobiles native network the whole trip but I guess those millions of people covered don’t count. ….and the GPRS towers! Yes, they still have GPRS towers out there. one thing is certain .. TMO is starting to be a master at grabbing the headline. 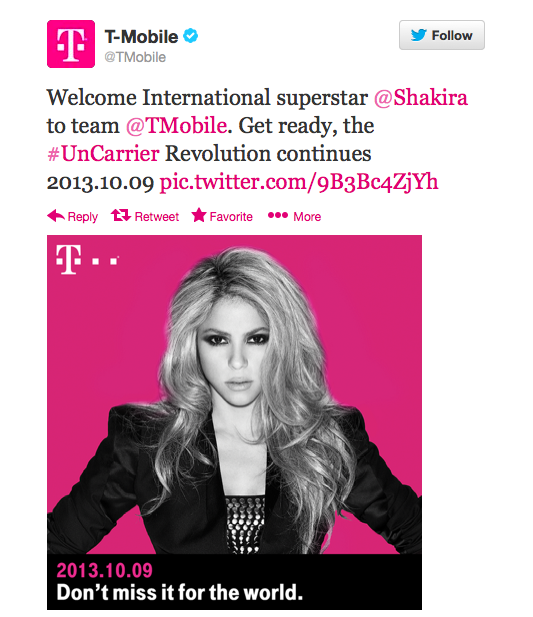 Something tells me Shakira is a hint, along with international. still complained about something. LoL. Maybe they will let us convert from classic with no fees, I’d like that. I still have 4 lines over there, and doing unlimited. But I could save some money by switching over, so I’m ready. But not ready to pay any fees to do it. if you have over a 5 year tenure they’ve been waving them for customers who want to switch. I’ve been with them for 16 years, they didn’t offer to waive the fees when I called. T-mobile has only been around for 11 years. Omni-Point, then Voice Stream, then T-Mobile…the only possible way (like me), but technically not with T-Mobile for all those years. Joe and Kalel33, if you think about it T-Mobile as a company has been around since 2001, but under a different brand. In other words, in 2001 the company was under the name voicestream, but under the control of Deutsche Telekom (DT). The point is the company policies and procedures were the same in 2001 as they were in 2002 even though the brands were different. Thus, T-mobile has been around 12 years. With one year under a different brand. Deutsche Telekom is the parent company of T-Mobile and since they acquired VoiceStream in 2001 they took control of voicestream at that point. Thus, the company (VoiceStream) in 2001 ran exactly like the re-branded company T-Mobile did in 2002 just under a different brand. On June 1, 2001, Deutsche Telekom (DT) completed the acquisition of VoiceStream Wireless Inc. for $35 billion. Deutsche Telekom started controlling the company voicestream in 2001. Thus, T-mobile offered the same things voicestream did in 2001, just under a new brand. In 2001 after Deutsche Telekom acquired voicestream and Prior to the company re-branding. I have been with T-Mobile since January 2005 and get $35 a month in loyalty discounts. Some of were Powertel before VStream/T-Mobile. tell that to my 13 year loyalty discount. In 2001 Deutsche Telekom took control over voicestream and so began its first year as a company in the U.S. Thus, T-Mobile as a brand has been around only 11 years, but T-Mobile as a company for 12 years. You have to ask for the waiver, and as long as you’ve been with them over 5 years they will waive all fees. How bout they just give us free shakira tickets? they announcing her so why not give us free shakira concert tickets? uh no… calling international numbers using Wifi Calling while in the United States will result in international rate charges… trust me I know since my family made that HUGE mistake and ended up with a $1,200+ bill! I’ve been using wifi calling fine since i’ve been in england and haven’t ran up a phone bill because I’ve been calling US phone numbers. I got a local sim to call/text local numbers, and I use wifi calling to call/text the states. Yeah it does. It goes from showing “Roaming” to just “T-mobile”. When I go to settings>about>status when on wifi calling under roaming it says “Not Roaming” or something like that. You don’t get charged for calling the states on wifi calling. It’s like still being in the states, unless you go over your minutes. Which I won’t have that problem because I have Unlimited Mins. In the Wifi calling options in order to avoid the possibility of accidentally dialing a US number while roaming I put to use wifi only, instead of “Wifi preferred”. If the signal isn’t strong enough it will kick you off of wifi calling and put you back on the roaming network. Just thought I’d put in my bit of knowledge. I would really like to know if the other two big carriers are shaking in their boots – . heh. It would be really cool though, if they leverage DT to come up with a sweet international plan making it a truly global service. I would really like to know if the other two big carriers are shaking in their boots – now we gonna have to change again to keep in the competition. heh. It would be really cool though, if they leverage DT to come up with a sweet international plan making it a truly global service. I vaguely recall this gal named Carly that was part of the T-mo ad family, guess she’s gone now? ALL customers, no matter how old or how cheap your plan is, will be force-migrated to a new Value Plan. Unlimited minutes will be the ONLY plan, with different pricing not available to customers unless being force-migrated. All legacy plans will be retired indefinitely, no migration fees for anyone on legacy plans, and your price may drop or increase when getting moved to the new plans. You will have until 2/1/2014 to cancel service with no termination fee should you not like the plan you will be forced to. Thankfully, single line Unlim Minute plans will start at just $20/MO vs the current $50 (again, not available to consumers, only those being force migrated, based on your specific needs). Once the force-migration finishes by December, it will be 100% Value or newest Classic with Bridge to Value as your only upgrade option, priced at the advertised rate, not the special price for forced-migrated customers. Last, deposits are 100% gone for new lines of service, regardless of credit score, but credit score will still determine down payment and EIP amounts for full priced phones. This doesn’t make any sense. There would be no reason to have the 2/1/2014 cancel date because moving everyone to new plans means no contract to begin with. Why would they get rid of classic to force people to a new Classic? New plans are no contract RENEWAL, this does not however remove your existing contract. They bought a discounted phone 8mo ago before all this Bridge to Value was available, hense they still have 16 out of 24mo left in contract. They’re now force migrated to a new value plan @ $80/MO (more minutes, data, etc) but they are upset about the price increase. They now have til 2/1/2014 to leave tmobile free of charge even if in contract. That’s pretty detailed… Where’d this bird get this info? Let’s just say, the bird wears the company logo on his work shirt, but wanted to get the correct info out there before someone else sensationalizes or spins it to be negative. The bird wants people getting stoked for Uncarrier! Unlimited minutes for everyone, at special non advertised rates! Meow indeed the bird told me! I get it, and in general appreciate the need to simplify the business rules. I would not want to try to maintain the code behind a billing system with 350 plans either. But even still, I don’t need unlimited minutes and I barely need texting at all. I truly miss my $29.99 300 minutes no text plan, I would go back to it in a heartbeat if I could. so will this add unlimited texting and web to all lines? like on the simple choice plans. I have the same question, I haven’t received any letter from T-Mobile yet. Our contract-based value plan is $80/month for 4 lines, 3 of which have data. Simple Choice would be a price hike for us with no added benefit (we only use 500 mins/month). All of our devices are unlocked…and poor coverage makes us want to port out..so if they did this they would promptly lose us as a customer. Read some of my updated info above, and remember there will be special pricing available to you that other customers can not get. I’m familiar with the plan you’re on, and you should not receive an MRC increase, unless opting out of the special rates and going to one of the advertised rate plans. The letter you will get should ease any questions. How can they “force” migrate someone?.. i’m not going to pay more for my plan! I only pay $84.60 for three lines and that better not change! Well under simple choice all your lines would have unlimited talk+text+ unlimited data (500mb high speed). All 3 lines would only cost you $90 a month so it won’t be much of an increase. You forgot to add in the data which is more expensive than the legacy plan’s cost per gb. If they decommission my $20 really unlimited 4g data that I got last Christmas and limit my roaming data harder, we have to leave. The fine print nobody talks about is that the so simple it’s stupid plan limits roaming data to 10 mb. You read that right. 10. I get 5 times that, 50 mb on Family 1k and my line 3 has to have more than 10. Probably time to go anyway, it’s just that paying off the EIP on 2 phones now is going to be annoying. I didn’t say anything about the price of my account, it’s the roaming data that’s the final straw. Fully aware that I’m probably looking at a rising bill either way, but due to coverage (Sml Roanoke) it’s not optional. I really have been on TMO since 2003 and I understand the services and how they compare to competitors, usually better than the csr I’m talking to. If Mr. Shhh knows about the roaming limit on the new double secret probation plan, that would help. Maybe it will be in the fine print, but I doubt it. I had to get to a retention expert before I found someone who understood this critical difference between my plan and the ‘Simple’ plan. If I don’t get more than 10 mb of data roaming, whatever the price, I have to move that line. It’s out of contract thank goodness. We’re in a similar predicament. I was going to migrate to Simple Choice, but 3/4 lines have 2GB of data and Simple Choice would be more expensive and only give us 500MB of data. All of our phones are unlocked and at that point we might as well just port to AIO or Straight Talk. At the end of the day, we need better coverage. So if the price goes up with no coverage benefit, why bother with them? Unless they make some serious coverage announcement as well…we’ll leave. Honestly the only reason we haven’t is the ETF. Hey lil birdie, any word on Xperia z1? So NONE of this was announced tonight? All I see all over the web right now is news related to international phone calls and international data. I can’t imagine it’s a huge chunk of their non-business customer base. I’m disappointed. I was hoping for some better news on our own soil! The force migration WILL happen, and it has to happen if they want to truly move 100% to the Uncarrier strategy. After receiving the letter, mailing Oct 10, there will be a 1-800 # to call to discuss options, although if you dont call, then the system has already picked a plan for you as detailed in your letter. The only real problem with MRC increases will be those on insanely low plans such as Prefered 75 for just $10/mo, or oldpromotional plans where they had $10 family texting and $5 add a lines with limited minutes, no text, no data. EVERYONE ELSE WILL NOT RECEIVE AN MRC INCREASE in 99% of situations due to the special nonadvertised rates they can get. All right, I guess I have to wait for the letter. This is why I hate having a phone contract, it can be torn up by the company for free but only at high cost by the consumer. I only got into this contract to lock in a rate plan I could afford in case of the ATT merger, I didn’t even take a subsidized phone at the time. Buying phones later on EIP has extended it. At least it sounds like no ETF might happen now, which would be appreciated. It’s very uncarrier. ANYONE BEING FORCE-MIGRATED WILL RECEIVE SPECIAL, UNIQUE, AND/OR DISCOUNTED PRICING ON RATE PLANS; prices that are not advertised and will ONLY be available to current Tmobile customers being force-migrated. If you didn’t like the price of the currently advertised Uncarrier plans, then consider this a blessing in disguise, as you will be able to get all the benefits of Uncarrier, at a monthly cost lower than what you see advertised today. Some will get more, save money, break even, and only in extreme cases of very old legacy plans with no features will you incur a price increase. To give you a detailed idea to ease your mind, currently there are over 350 different rate plans across all tmobile customers since they started in the USA many years ago. This transition will not bring those 350 down to just 1 plan (the plan you know of as the current Simple Choice Value Unlimited Everything $50/$30/$10). It will bring those 350 down to just 50. That’s still 49 more options than you see advertised currently, to ensure everyone is happy with the cost and benefit of being 100% Uncarrier. Letters which detail the specialty pricing offered unique to your account(s) will be mailed October 10th for Family Plan rates, and Single Line letters have just been mailed already. Uncarrier for everyone! Get pumped! And look for your letter in the mail if youre on an old legacy plan to see what you can get! This is a great change! I have a military discount on my current 1000k minute Value Plan… will I be able to keep that discount if I am forced migrated onto the Simple Choice plan? T-Mobile loves surprises! Phase 3 may have more than what the birdie told me, we’ll just have to wait and see! Thanks, David, for this announcement of the announcement of the upcoming announcement. Don’t look at me, I’m just letting you know something is coming! Do you have even a smidgit of info regarding what Phase 3 is that you can share? I’ve already posted two separate groups of information, no? If you did, I probably missed it but I see nothing but posts about Brightspot and that Gear watch thingie. in between. Lol somebody doesn’t want the Phase 3 info leaking and is trying to down vote the comments detailing the upcoming changes. Well turns out the info is spot on. As a higher up TMO employee, I can say that there is no info on the below uncarrier 3.0 info in our internal community site. It’s all speculation right now. Just fyi. any word on the xperia z1 yet? The unlocked international version (Model # C6903) runs on T-Mobile and has LTE. OK, a concert to kick it off. Don’t tell me it’s some kind of lame Spotify type music service. I am very anxious to find out about phase 3. I have 4 lines with Verizon with unlimited talk, text and share 10GB of data and our contract it’s up on all 4 lines. This cost me $350 per month! One of the lines is my son’s that just finished Army boot camp and is headed to Colorado (Ft Carson) and will be deployed to Afghanistan for a year in March. I really want to move to T-Mobile but I need to make sure the LG G2 work for him while overseas. I cover 6 states for my job (AZ, NM, CO, MT, WY & Utah) and need to make sure the same phone as above will get voice and text at the very least while in MT, WY, NM. Also that GPS will work as intended in these areas. Internet isn’t that big of a deal as I can wait to get on Wi-Fi at the hotel. I guess I have a question… what will I give up by going to T-Mobile over Verizon as far as service is concerned? Thanks for any help. We drove trough CO, WY in 2008 and NM in 2010, I can report we had coverage as far as calls are concerned. On CellMaps app I see that T-Mobile does not have coverage in WY and MT. When we drove trough WY I noticed my phone was attaching to a 3rd party provider so it was roaming, and it was the only service showing up, AT&T wasn’t coming up when I scanned for networks. So in MT and WY you will roam on AT&T, and/or a third party local wireless carrier for sure. On T-Mobile you will give up the native network coverage you get with Verizon. Now, how much it would affect you, you wouldn’t know until you move to T-Mobile. Coverage is highly YMMV. No one can tell you that it would work out for you. I’d personally get 1 line of service with T-Mobile and use it for a while as the main phone to gauge how it works out being on the T-Mobile network before moving over. GPS is independent of the cell phone network. If you have sky above you you have GPS regardless. Thank you very much for the information. Your time is greatly appreciated. with the savings you get sometimes keeping an att mvno sim makes sense. I live in NM and have Tmo coverage. The main metro areas you shouldn’t have any problems with voice or data. The interstates and most bigger highways are all covered too. The only areas you’ll have to watch out for are in the more mountainous areas (nobody really has service in those areas) and the places out in the middle of nowhere. Otherwise if you’re sticking to the main areas and decently populated areas you shouldn’t have any issues. Not to slight Shakira but I would prefer Carly and MORE COVERAGE. @Barrera, thank you very much for the info. Why does nobody know what time this event starts??? I been searching google for hours and not a single post about what time it starts!! 8:15PM Eastern. T-Mobile tweeted a pic the other day. And it’s on their Facebook page.